Costa Mesa bowling champion Barry Asher was elected to the Professional Bowlers Association (PBA) Hall of Fame in 1988 and the American Bowling Congress (ABC) Hall of Fame in 1998. 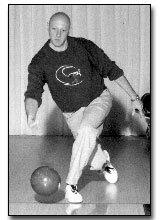 His career record includes ten PBA tournament titles, four ABC titles, and he was a three-time collegiate All-America, 1971-1973. Asher has rolled twenty-two 300 (perfect) games.